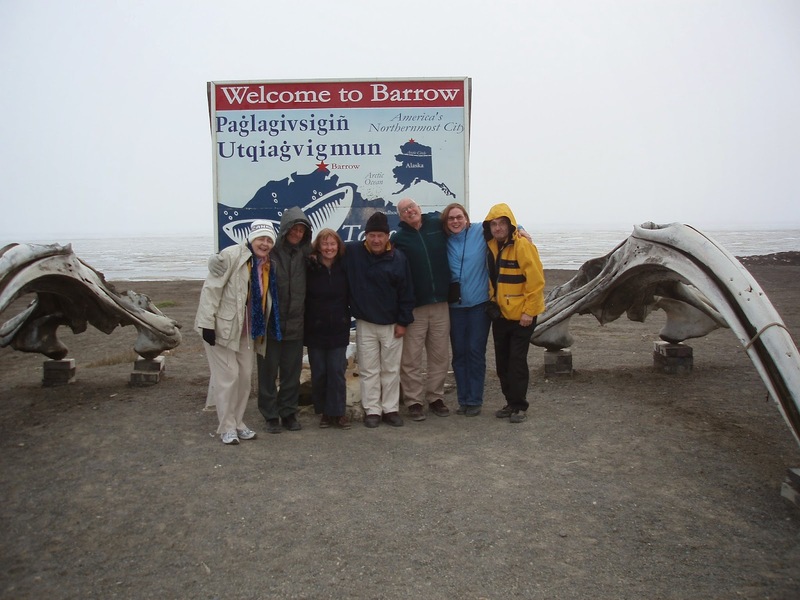 Welcome to Barrow, America’s northern-most city: Australian District 9780 Rotary Friendship Exchange and District 5010 Rotary Club of Barrow members enjoying time together in Alaska. Cathy Roth is far left and husband John on the far right. Scanning the hazy horizon bathed in the eerie, half-light of an Arctic summer night, our quietly-spoken Inuit guide warned us that polar bear were close by, and that we should stay close to our twelve-seater van. Curious otters, bobbing up and down, like arcade air-gun targets, peered at us from the still sea. The myriad of small ice-flows reflected the long, thin fingers of moonlight. Here we were in June 2007, eleven Australian Rotary Friendship Exchange members from District 9780, standing on the very tip of Alaska, and well into the Arctic Circle, looking across the sea-ice to the North Pole. It was almost surreal. As the bitter coldness clawed at our throats, it was hard to imagine living through a winter here. Yet in this environment of self-preservation, the beauty, the fullness, and the magnificence of Rotary shone through, more than I could ever have believed possible. As homes and hearts of Rotarians were thrown open to host us, so too was revealed a caring and a selflessness for their community that was humbling. Community service includes the Inuit communities which for centuries have lived alongside nature in a sensitive ecological balance. Projects include the provision of warm parkas for Inuit children attending school in the bleak winters, and the fostering of Inuit tourism ventures enabling culture and dignity to be maintained whilst economic independence is able to be established. Rather than work for the community, Rotary in that northern-most point of our globe works with the community, quietly, unassumingly – a little like Rotary’s founder Paul Harris himself. Seeing this Rotary in this environment, was more than humbling. It was a quiet reminder of Rotary’s responsibility to be a guardian to every facet of our global environment, as well as the incredible ability Rotary has to impact every nation and all its peoples. While not a NZ Pacific story, this is the first of a series over the coming months that will illustrate why various 'ordinary' Rotarians are Rotarians. Cathy Roth was instrumental along with Beryl Robinson in bringing to and establishing Rotary Leadership Institute in New Zealand and Australia.